A collection of Christmas music from 1741 to 2018 by violinist Rob Landes, ft. Lynn Jones on the guitar. Landes has made some popular videos in the past few months, such as the anime music compilation last October. You can check his YouTube channel for more violin music and stuff. 2018 is a poor year for me in many ways, but that’s nothing compare to all the natural disasters and man-made crises around the world. I can only wish the best for those who are suffering, but from recent trends there’s a better chance that the world is becoming messier instead of a better one. Be grateful if you are living a relatively normal life. Merry Christmas, and Happy New Year. Short English documentary about Haruo Nakajima, the man who portrayed Godzilla in the first 12 movies of the popular Japanese media franchise. The costume was made of concrete in the first Godzilla film in 1954, that alone deserves respect LoL. Check the rest about his early career from the video. Nakajima also played other giant creatures in various movies and in the Ultraman TV series. Hence, in some ways he’s the real king of monsters in Japan. He retired from his suit acting roles in 1972. Fans still remember him fondly, and many people credited him as the greatest suit actor of all time. [Update] The legend passed away in August 2017, aged 88. Video by travel blogger Jacob Laukaitis who visited North Korea with a tour group earlier this year. He revealed the basic do’s and don’ts at the beginning of the film, and he didn’t hide the fact that most of the things he seen were staged. Set politics (and atom bombs) aside, an interesting tourism video for the “mysterious” country. It reminds me of my trip to China in late 90’s, in other words North Korea seems to be 15-20 years behind some parts of the world. The annual Magical Lantern Festival at Chiswick House and Gardens in west London. Photo of the Wedding Palace in Ashgabat, the capital city of Turkmenistan. The eleven-storey building is a civil registry centre. It’s constructed by Turkish company Polimeks and opened in 2011. Besides registration of marriage and other civic services, the “palace” has wedding halls, banquet rooms, and a hotel. It also has boutiques and shops that provide essential items for a proper wedding. 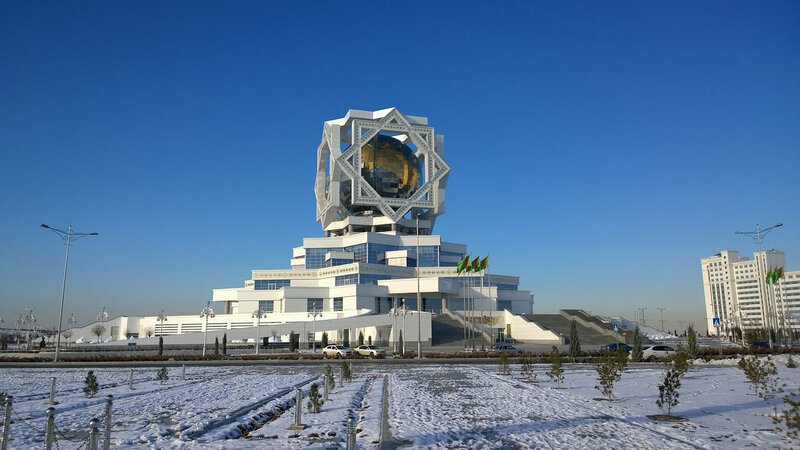 The cube on top has the form of an eight-pointed star on each side. The star is a common Islamic geometry pattern; it’s also the background of the national emblem of Turkmenistan. The shiny “ball” at the centre of the cube depicts planet earth, not sure what’s the hidden meaning behind that though. Interesting architecture regardless. It’s a mix of traditional and futuristic elements. The death toll following the earthquake in Nepal has risen to over 4300 and still rising. United Nations says that eight million people have been affected, and over a million need food aid. I’m not a religious person, pray if you wish (no sarcasm meant) but it’s more practical to send donation via relevant bodies.